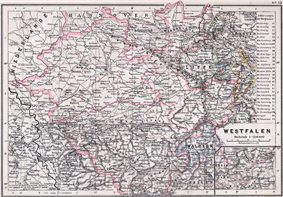 The Province of Westphalia (German: Provinz Westfalen) was a province of the Kingdom of Prussia and the Free State of Prussia from 1815 to 1946. Napoleon Bonaparte founded the Kingdom of Westphalia, which was a client state of the First French Empire from 1807 to 1813. This state shared only the name with the historical region, containing mostly Hessian and Eastphalian regions and only a relatively small part of the region of Westphalia. the Duchy of Westphalia, placed under Prussian rule in 1815 after the Congress of Vienna. In 1816, the district of Essen was transferred to the Rhine Province. After the end of World War II, the province was merged with the northern half of the Rhine Province to form the German state of North Rhine-Westphalia in 1946, with the addition of the former state of Lippe in 1947. The Prussian central government appointed upper presidents as their representatives in the province, supervising the implementation of central prerogatives in Westphalia. Between 1920 and 1933 their appointment needed the consent of the provincial diet, in those years directly elected by the Westphalians. The provincial diet, until 1886 represented by the Westphalian rural counties and independent cities in 1886. These districts and cities then formed the public-law corporation called the provincial federation (Provinzialverband). The elected speaker of the provincial diet, first titled land director (Landesdirektor), but renamed land captain in 1889, was simultaneously head of the provincial government, called provincial committee (Provinzialausschuss). Between 1920 and 1933 the provincial diet was directly elected by the Westphalian elctorate. As of 1933, in the course of the abolition of parliamentarism in Nazi Germany, the land captains were appointed by the central Prussian government, presided over by Hermann Göring, and became subject to the directives of their respective upper president. Kolbow was still elected, by a provincial diet dominated by Nazi mandataries, his successors were appointed, with the diet officially dissolved in 1934. The task of the Westphalian provincial federation is carried on by the Regional Federation of Westphalia-Lippe, established in 1953 and also including the county comprising the territory of the former Free State of Lippe, disestablished in 1947. 1 Became Province of Posen in 1848. 2 From the Lower Rhine and Jülich-Cleves-Berg.